There isn’t a week that goes by that someone doesn’t start spouting their views on the Confederate flag issue. What I find interesting is that both sides are almost always completely misinformed? In an effort, to educate both sides I have done extensive research into both the Union and Confederate Flags during the Civil War. I believe you will find it very illuminating. During the Civil War Nevada was firmly with Lincoln and the Union. Isolated from the war by pure logistics, the Civil War did not spill across the Nevada borders. Nevada did muster a Battalion of Civil War volunteers. (The 1st Battalion, Nevada Volunteer Cavalry). The volunteers did not participate in any Civil War battles with the Confederacy but did play an important role in making sure that supply lines to the east were kept open. They were also valuable for their scouting information. This led to many encounters with hostile Indians throughout Nevada. The 33rd state to join the union was Oregon in 1859. This was our Flag for the next two years under Presidents James Buchanan (1857-1861) and Abraham Lincoln. 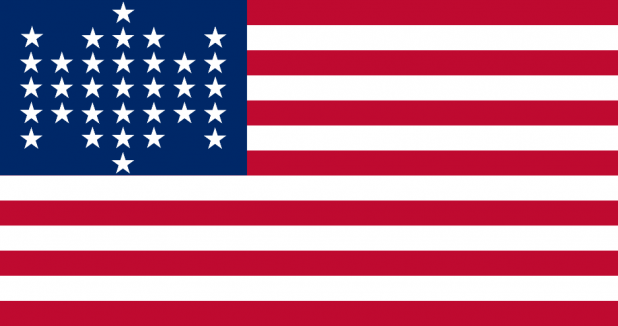 At the outbreak of the Civil War in 1861, President Lincoln refused to remove the stars representing those states which seceded from the Union. This very popular variant design was proudly displayed by many patriotic Americans. It was never officially used by the military or any government organization. It should be noted here that Congress had never made any regulation about what type of star pattern should be used on the “official” United States flag. Therefore, any pattern was acceptable. The Navy regulated the star pattern on their “boat” flags to horizontal rows, but the Army and civil government did not. This explains the many different star patterns. The 33-Star flag that flew over Fort Sumter is sometimes called “the flag that started a war.” The fort’s commander was Major Anderson when the first shots of the American Civil War were fired in Charleston harbor. He surrendered to the Southern forces under General Beauregard after three days of token resistance. 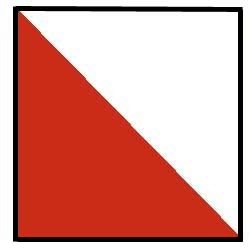 Ever since the Mexican-American War, around 1845 the Army had followed an unofficial tradition of using a “diamond” pattern for the stars on their garrison flags. The Fort Sumter flag is a good example of that practice. In the first 3 months of the war a star was added when Kansas joined the Union in 1861. It remained our Flag for the next two years. President Abraham Lincoln was the only President to serve under this flag as the Civil War raged. These national presentation colors were manufactured by the Evans & Hassall Company of Philadelphia for all the Union New Jersey regiments after 1863. This flag became our flag when West Virginia separated from Virginia to join the Union in 1863. It remained our flag until the end of the Civil War. Presidents Abraham Lincoln (1861-1865) and Andrew Johnson (1865-1869) served under this flag. This is the regulation 35-star cavalry guidon that was carried by mounted Union troops during the Civil War. The inner circle contains 12 stars, the outer circle includes 19 stars and each corner includes a single star. It usually would be customized by placing a troop letter or other designator inside the circle of golden stars. This was the cavalry guidon used by the 1st Battalion, Nevada Volunteer Cavalry in Nevada. Although Nevada became a state on October 31, 1864, U.S. flag statutes dictated that the new flag is not official until July 4th of the following year. There were still many 36 Star flags made especially in Nevada and a few in Washington D.C. An interesting historical flag note, a 36 Star American flag was used to cushion President Lincoln’s head wound after being shot at Ford’s Theater. 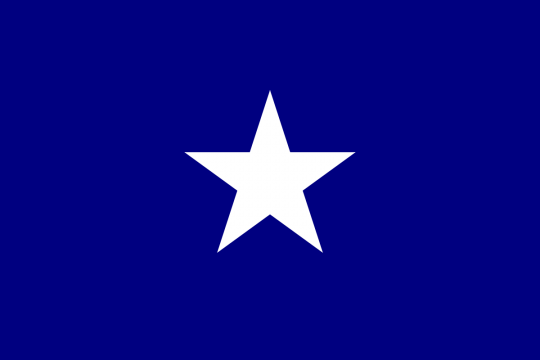 The lone star flag was flown at the “Convention of the People” in Mississippi on January 9, 1861. It was later celebrated in the popular song “The Bonnie Blue Flag” which was sung by southern troops on their way to battle. Although never officially one of the national flags of the Confederate States of America, it was considered one by the soldiers and southern people. 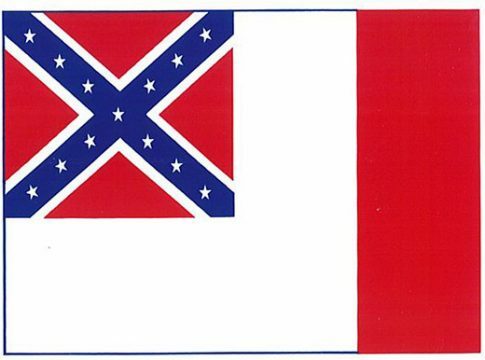 The units from Louisiana and Texas adopted the Bonnie Blue as their official banner of the Confederacy. The design of the Texas State Flag was strongly influenced by the Bonnie Blue Flag, that is of course used today. This flag was adopted but never officially enacted. In their haste to have a flag prepared for the flag raising ceremony on March 4, 1861, the Confederate Congress neglected to formally enact a flag law. But, make no mistake, the First Confederate flag was the official flag of the Confederacy. 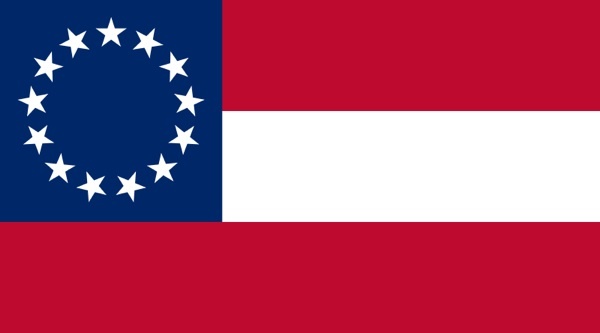 When this flag was first raised over the capitol building in Montgomery, it contained seven stars, representing the Confederate States at that time. This was also the flag used by General Beauregard at the First Battle of Bull Run (First Manassas) in 1861. 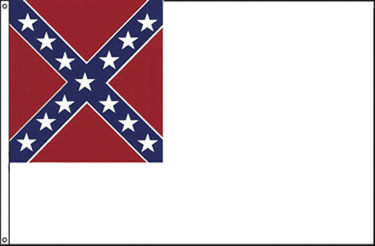 This design was also used as the Confederate Naval Ensign between 1861-1863. Strangely enough, one of the most persistent myths about Confederate flags concerns the First National flag. This myth states that this flag only saw combat at the First Battle of Bull Run and was then replaced by the Army of Northern Virginia Battle flag. In, reality the First National Flag (and its different versions) saw more battle service than any other and was still in use at the end of the war. Much like the flag of the United States the Confederate States added stars as they added states. By May, North Carolina was added, and by June Tennessee had joined to increase the number to eleven. The First National Flag eventually had 13 stars. The admission of Kentucky and Missouri in September and December brought the circle of stars to thirteen. Although there were only 11 states in the Confederacy, there were stars added for Missouri and Kentucky because both sides claimed these states. Missouri and Kentucky actually, had two state governments: the elected governments which seceded and joined the Confederate States and provisional governments created by the Union who actually-held them. 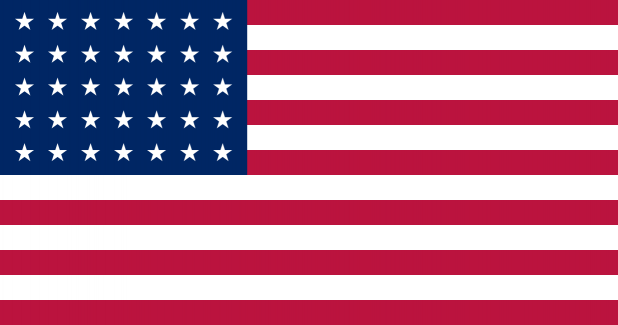 Another popular legend stated that because the pattern and colors of the Stars and Bars flag did not distinguish it sharply enough from the Stars and Stripes of the Union Flag, it sometimes led to confusion on the battlefield. These fictitious people demanded a new flag because they wanted a flag that didn’t look like the Union flag in anyway. However, the real reason there was backing for a different flag design had nothing to do with the Stars and Stripes Union Flag. It had to do with the members of the Confederate Congress seeking a more “Confederate” flag, to honor the Army of Northern Virginia and the battle flag that they fought under. The Northern Virginia Army was the most popular and most successful army during the entire Civil War. Led at that time by Robert E. Lee and Thomas J. “Stonewall” Jackson. Therefore, on May 1, 1863, a second design was adopted for the Confederate National Flag which angered a lot of people in the South. The flag design used the “Southern Cross” Battle Flag of the Northern Virginia Army as the canton on a simple white field as seen above. This second design was sometimes called “the Stainless Banner” and is sometimes referred to as the “Stonewall Jackson Flag” because its first use was to cover Stonewall Jackson’s coffin at his funeral. The nickname “stainless” referred to the pure white field. 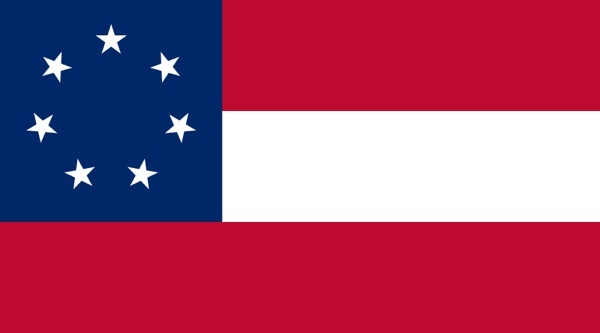 This design was also used as the Confederate Naval Ensign between 1863-1865. Ironically, it was soon discovered that the Second Confederate National Flag (see above) was easily mistaken for either a white flag of surrender or parlay flag, especially when the air was calm, and the flag hung limply. It was decided that this flag had to be modified. 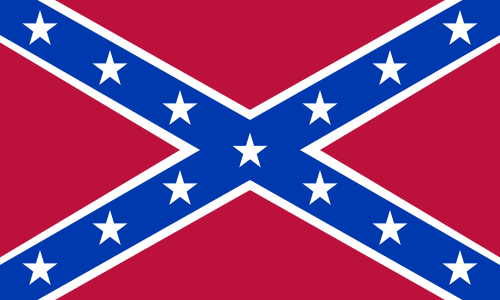 Not until 1865 was officially replaced by this third and last Confederate National flag which had a large vertical red stripe placed along its right edge. The flag was not widely used because of the rapidly approaching end of the war. Some examples of the last flag were used at hospitals and unit battle flags until the South surrendered on April 9th. 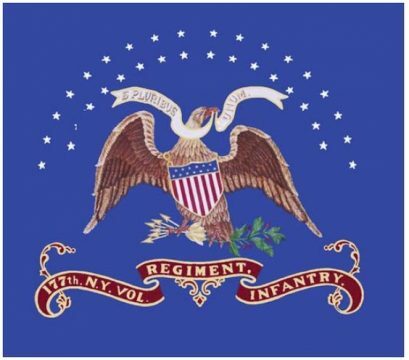 The Use of distinctive battle flags by regiments of the army is not unique to the Confederacy. For centuries British regiments have carried, in addition to the King’s Colors, a distinctive regimental flag. From the War of 1812 through the War between the States, regiments of the United States carried battle flags. 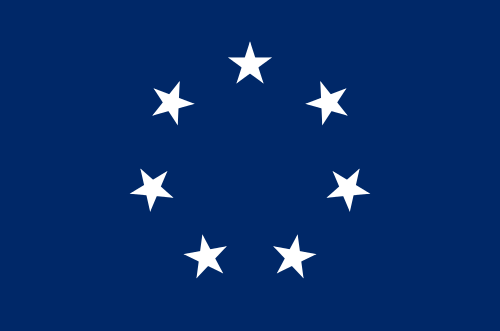 One of the most popular was a blue flag with an eagle and shield of the Union. 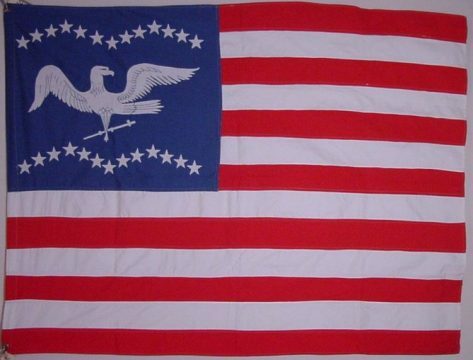 The great John Fremont used an eagle flag variant when he stepped into what is now known as Nevada. Regiment and guidon flags are used by the present day United States military. Because the regiment flags were carried on the field of battle as a major means of identification, commanders tried to design battle flags that were easy to recognize and to distinguish their units from other units during battles. The Confederate Battle flag for the Army of Northern Virginia, seen above. The most popular and successful Army during the Civil War. The Confederate Army of Peninsula was under the command of Confederate General John Magruder in the early days of the American Civil War and it was General Magruder who ordered this flag made for his command in April of 1862. The 3rd Kentucky Infantry was organized in 1861 in Tennessee. It was a part of Kentucky’s “Orphan Brigade,” until late 1862 when it was reassigned to the Army of Tennessee. Further research now shows that these flags were not just for the Orphan Brigade but rather, were the battle flags of General John Breckinridge’s whole division. This unit fought at most of the major battles of the Army of Tennessee. They surrendered to Union forces at Bennett Farm, which today is the City of Durham in Durham County, North Carolina. 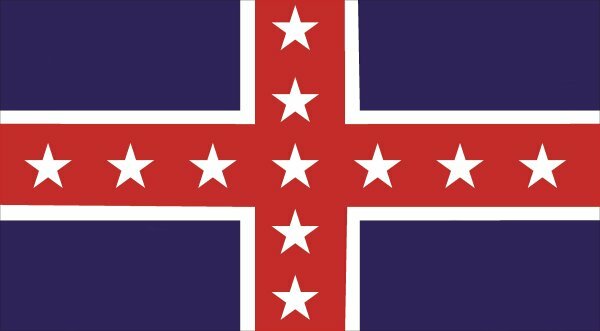 They used a second version of the Polk Battle Flag, issued in the summer of 1862, which had a cross edged with white and only 11 stars. 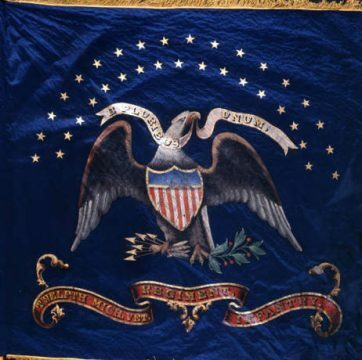 The Polk Battle Flag continued in service through 1863. This was a battle version of the First Confederate National Flag captured by Union forces at the Battle of Pea Ridge. It was made of wool flannel, with the words “Jeff. Davis” worked in black velvet letters. General Lee’s Headquarters flag was used between June of 1962 and the summer of 1863. The unusual star arrangement was believed to have been designed by his wife Mary to reflect the Biblical Arch of the Covenant. 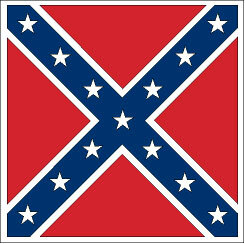 The design as you can see is very close in design to the Stars and Bars Confederate National Flag. As you have read, the Confederate States of America followed the precedent established by Great Britain and adopted by the United States in the use of flags. Navy flags were no exception. It should be noted that Navies have their own specific flags and flag terminology. Navy precedent for both the Union and the Confederacy dictates that an Ensign or National flag be flown from the stern of the ship. A “Jack” flag is flown from the bow of the ship. It was also tradition of using the canton of the national flag as the “Jack flag”. The Jack flag is only used for ships of war and then only when the ship is at port. The “Commission” pennant is flown from the main mast of a ship and designates the status as a commissioned vessel of its country’s navy. The pennant is only displayed by a ship that is in national service. the Union had at the time. The number of stars depended upon the number of states the Confederacy had at the time. After the Civil War ended not many people were anxious to show pride in individual state’s rights or state independence. So, consequently the creation of state flags was not a priority, in fact it was frowned upon. But, with the beginning of a new century came a resurgence of American pride and patriotism. The resurgence of patriotism which up until then was reserved mostly for men would help rekindle the fight for voting rights for women and for the first time there was an acceptance of women showing national pride. Organizations such as the National Society of the Daughters of the American Revolution were formed to promote patriotism and civic pride and many of the members were also in favor of voting rights for women. The suffrage groups would use the state flag as a rallying symbol in each state to pass women’s voting rights laws. Other groups used the state flags to promote civic pride and patriotism. 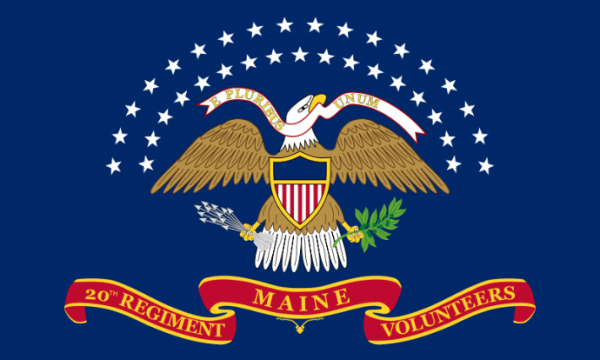 No other group or organization is more responsible for promoting and creating so many of our beautiful state flags in America than the National Society of the Daughters of the American Revolution. In conclusion, as you have read and learned, the use of the Confederate Flag above, which is currently causing so much controversy was only used as a Naval Jack Flag and as a variant Confederate Regiment Battle Flag, for a few Confederate Army Units. It makes me chuckle when people proclaim that their desire to fly the Confederate Flag is just a part of history and they point to the Confederate Flag above. If their desire to fly the flag was for historical reasons only they would be flying the real historical Confederate Flag, which of course is the First, Second or Third Confederate National Flag or one of its variants shown above. But, of course the real reason for flying a “Confederate Jack Flag” is to cause controversy. I’m not saying that a person should not be able to fly any flag a person wants to but if you’re going to, at least fly the correct flag and be honest for the reasons you’re flying it. On the other hand. 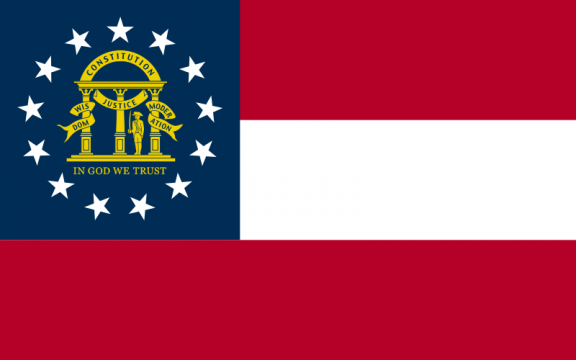 The same people who chastise anyone that wishes to fly Confederate Flags or any flag that they feel offends them decided a few years back that the Georgia State Flag had to be changed because it was a symbol of bigotry. 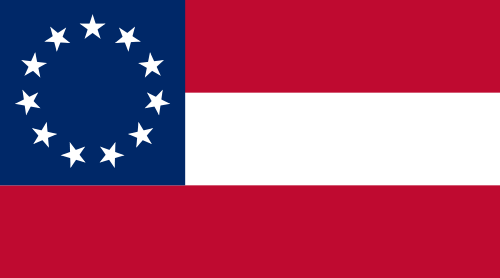 These same people with no toleration of any kind decried the old flag of Georgia for having part of its design displaying a variant of a Confederate Flag cried for change. So, what did these people of no toleration replace the Georgia Flag with. They replaced the old flag with a design that is clearly the real Confederate Flag including the 13 stars in the canton. 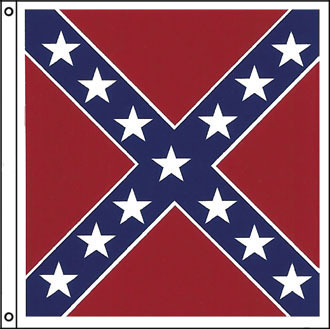 The only thing different about this flag from the real Confederate National Flag is the symbol in the middle of the stars with the words “Constitution, Justice, Wisdom, Moderation and In God We Trust”. Ignorance it seems is on both the left and the right.